What's the difference between antiperspirants and deodorants? Antiperspirants: Stop you from perspiring or sweating. Deodorants: Stop the bacteria in your perspiration from smelling, often by killing the bacteria or neutralising the smell. Many commercial deodorants contain a host of chemicals, among them aluminum. Aluminum is a very widely used active antiperspirant ingredient that aims to keep our underarms fresh. Whether they’re in the form of aluminum chloride, zirconium, chlorohydrate or hydroxybromide, aluminum salts inhibit the sweating process. Studies indicate that aluminum is a chemical acting as a neurotoxin that has been associated with neurodegenerative diseases like Alzheimer’s. Furthermore, the antiperspirant effects of aluminum could prevent (to some extent) the skin from releasing toxins via sweat. No matter the reason, if toxins accumulate, they tend to cause cellular changes, which in turn increases the risk for cancer. Other concerning studies also imply on more potentially detrimental effects of aluminum like kidney disease and liver damage (a study done by the Saint Louis University). Another common component in antiperspirants are a group of chemicals known as parabens that may have correlation with breast cancer because of their estrogen-like effects, but evidence is scarce. Organic deodorants don’t contain aluminum, alcohol or artificial perfumes. There are no harsh chemicals that could potentially irritate sensitive skin. Organic products won’t clog your pores. 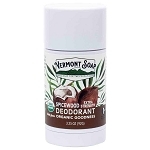 All of our deodorants are made from 100% organic coconut oil, cornstarch, essential oils and beeswax. Never any propylene glycol, triclosan or alcohol; this is product for people who care about their health and the health of our world.